My first week in Melbourne, Australia, I devoted hours to my lap top – confined to the free wifi at McDonalds or scrounging networks along St. Kilda’s beachfront. While I was lucky enough to travel with a group of other friends, we were still fairly helpless about applying for jobs, looking for apartments, opening bank accounts and sorting through the country’s tax codes. If only we’d had a few reliable and honest online resources, rather than mind-numbing lists of ineffective websites on Google Search results. The personal anecdotes and lessons from other working holiday makers could have saved us a lot of time – and at least a few dollars in McFlurries! Caroline In The City – A working holiday isn’t all about paychecks, as Caroline documents through her excursions around Australia. Check out her destination-based tales and tips, from Darwin and the Top End, all the way down to Melbourne. Elsewhere – This Belgian freelance illustrator is chasing an epic goal: “photographing every single place on the planet” before she dies. Her detailed images of Sydney beaches and outdoor adventures provide visual temptation to move Downunder. Escaping The Mainstream – While U.S. citizens are ineligible for a second working holiday visa in Australia, most other backpackers are – and Connor has the expertise to help applicants through the process. His travel playlists, also on the site, create an appropriate soundtrack to road trips around the country. Girl, Unmapped – After a three month journey around South America turned travel into an appealing lifestyle, Rachael moved to Australia with her boyfriend. Her blog combines helpful guides on job hunting, eating out and finding accommodation, with her own experiences getting settled. Lateral Movements – A working holiday in several places, including Ireland and New Zealand, shaped this American into a preferred expat. Here, learn about the ins and outs of employment in six different foreign countries. Leave Your Daily Hell – As the title implies, Robert left his so-called “ordinary” life in 2009 and now happily survives by writing guides and acting as a travel coach for beginning travelers. His guide to Australia showcases its most impressive locations, using captivating photographs and anecdotes that will get you “cozily acquainted” with the country. The Little Backpacker – Jodie may consider herself short, yet her checklist for getting a working holiday visa in Australia is anything but. After mining the internet for answers to her own visa questions, she designed an in-depth break down of everything you need to know before you go. Living In Another Language – These two Americans sold everything and moved to New Zealand for a year. They outline the working holiday visa application process, then charm you with stories from the country’s more unusual sites and stops. The Lost Girls – Founded by three friends who took a year off to travel the world (and later wrote a book about it, under the same title), Lost Girls features posts from an assortment of informed female writers. Learn how to find the top jobs in New Zealand, teach in Korea and a slew of other work abroad subjects. Paul’s Adventure – Blogger Paul taps into a niche market for folks interested in living and working in Japan. Though not an option for U.S. citizens, readers from other countries can follow Paul’s guide for a jump start on the application process. yTravel – Currently road tripping around Australia with their two daughters, Caz and Craig were named one of Australia’s top bloggers in 2014. Their “12 Steps To Travel” guide will get you motivated, while their posts on working holidays in Europe and North America offer a broader insight into global visa opportunities. Where do you turn to for information on working holiday visas? 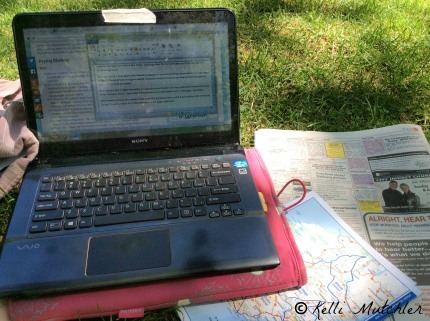 Has another blogger’s adventures inspired your own working holiday? Kelli left a small, midwest American town to prove that Yanks can, and do, chose alternative lifestyles. Desperate to challenge this stereotype, Kelli has served over 10,000 pints of foreign beer; played the organ at five funerals; participated in two motorcycle rallies and plunged too many clogged toilets. After working with Burmese refugees in Thailand, she decided to pursue a MA in Global Development and is, naturally, getting distracted (and paid) along the road back to school. She believes opportunities for international work and volunteer travel are as common as corncobs in her native South Dakota: surrounding us in every direction.